There is something close to a dozen comets visible throughout the year on any given night in the night sky. Many are faint, usually in the range of 11th to a 13th magnitude that requires larger telescopes to see. 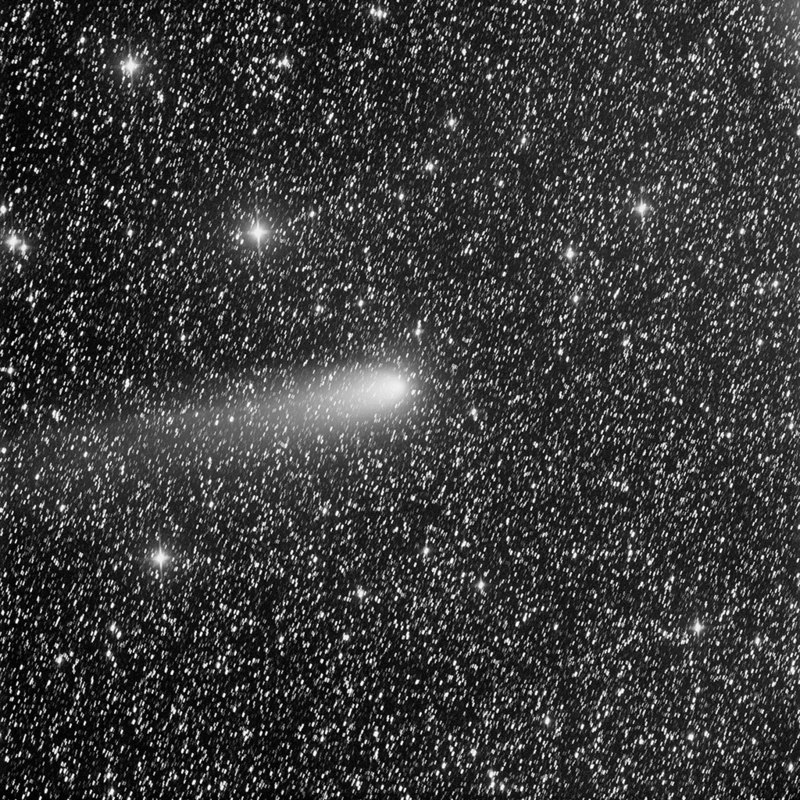 This time around, we have a wonderful exception, Comet 21P/Giacobini-Zinner. However, this bright comet has the company of other fainter comets that were recently imaged on Insight Observatory's Astronomical Telescope for Educational Outreach (ATEO-1). These comets that were imaged consisted of the bright comet named above, 21P/Giacobini-Zinner, 37P/Forbes, and 64P/Swift-Gehrels. 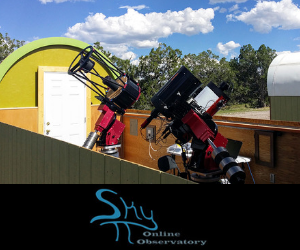 As Insight Observatory System's Engineer, Muir Evenden, was testing the latest updates on the ATEO Portal on the morning of September 13th, he realized that no comets have ever been imaged on the 16" f/3.7 astrograph imaging telescope. Knowing that there were a plethora of comets that were visible at the time he was imaging, he thought why not test the wide field of ATEO-1 on a few comets. 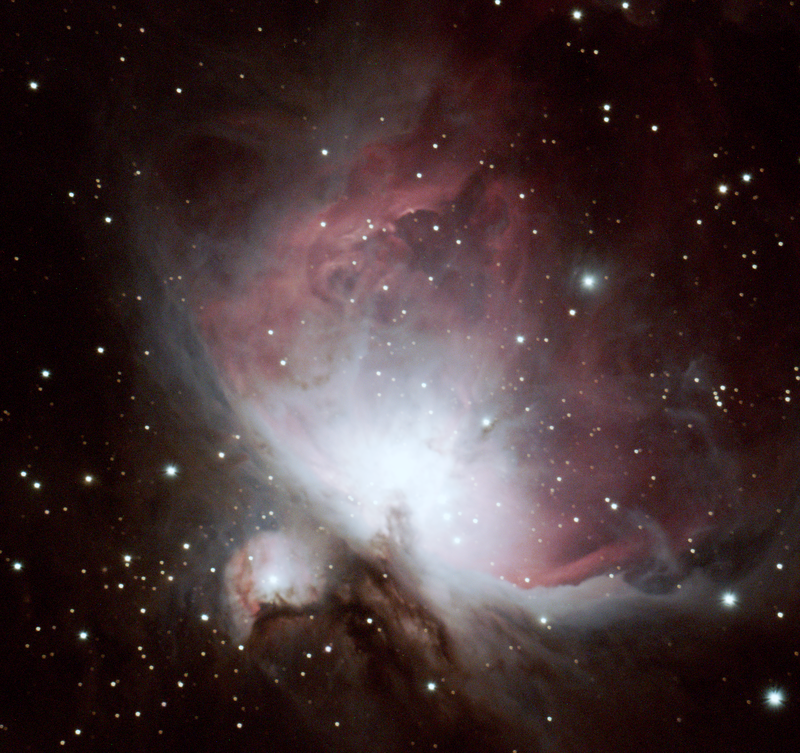 The results were most satisfying due to the wide field of the telescope and resolution CCD camera. 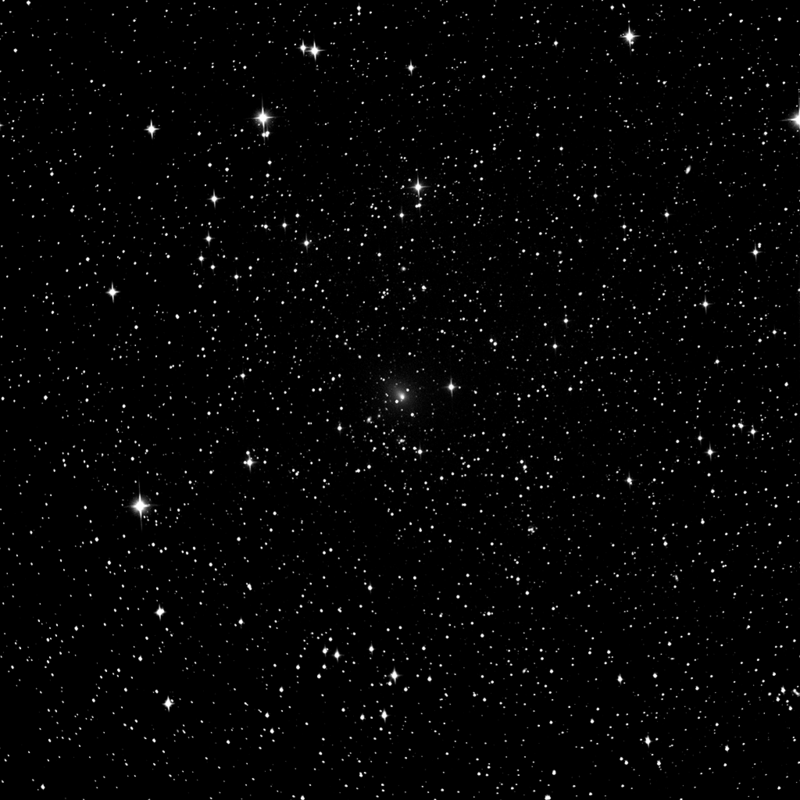 Comet 21P/Giacobini-Zinner imaged at 300-second Luminance binning 1. Imaged by Muir Evenden. The first target, 21P/Giacobini-Zinner is a periodic comet that was discovered by Michel Giacobini from Nice, France, who observed the comet in the constellation of Aquarius on December 20, 1900. It was recovered two passages later by Ernst Zinner from Bamberg, Germany while observing variable stars near Beta Scuti on October 23, 1913. During its apparitions, Giacobini–Zinner can reach about the 8th magnitude, but in 1946 it underwent a series of outbursts that made it as bright as 5th magnitude. It is the source of the Draconids meteor shower. Giacobini–Zinner was the target of the International Cometary Explorer spacecraft, which passed through its plasma tail on September 11, 1985. In addition, Japanese space officials considered redirecting the Sakigake interplanetary probe toward a 1998 encounter with Giacobini–Zinner, but that probe lacked the propellant for the necessary maneuvers and the project was abandoned. With an orbital period of 6.6 years, it's a common visitor to our night skies. 21P/Giacobini-Zinner is making a favorable approach at this apparition, passing just 58.6 million kilometers on September 10–11, the same date it reaches perihelion. That's just a few million kilometers shy of Mars's close encounter with the Earth this past July. Comet 37P/Forbes faintly placed between two galaxies. NGC 7518 is the galaxy at the top. Imaged by Muir Evenden. The next cometary target was 37P/Forbes is also a periodic comet in the Solar System. The comet was discovered on August 1, 1929, by Alex Rosebank and F.I. Forbes of, South Africa in the southern constellation of Microscopium. The comet nucleus is estimated to be 1.9 kilometers in diameter. The comet has been seen at every return since 1974. Prior to the 1999 apparition, the best returns were those of 1974 (magnitude 13) and 1993 (magnitude 14). 37P/Forbes seemed to be heading for another normal apparition in 1999 when it attained its predicted total magnitude of 13 at the end of May and early in June. Then the comet seemed experienced an outburst around mid-June when observers began reporting a brightness of magnitude 11, if not slightly brighter. As the comet moved away from both the sun and Earth, it finally faded back to 13th magnitude by early September and was near 14 around mid-October. 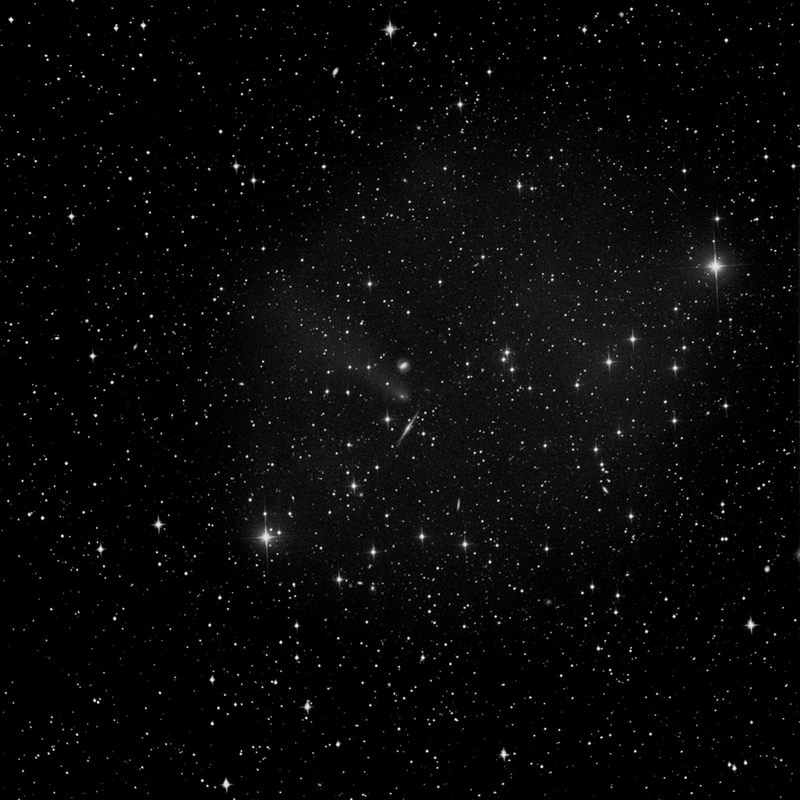 Comet64P/Swift-Gehrels seen here with a small tail. Imaged by Muir Evenden at 600 seconds, binning 2. 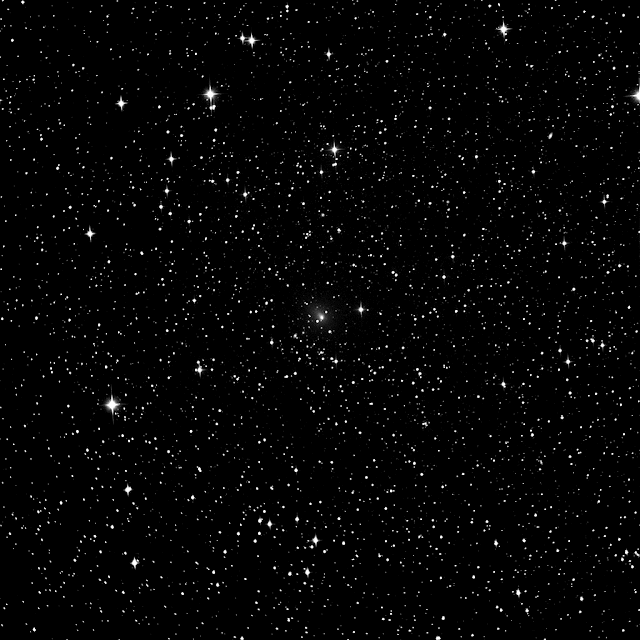 Imaged last, but not least was Comet64P/Swift-Gehrels. This comet is a periodic comet in the solar system which has a current orbital period of 9.23 years. It was originally discovered on 17 November 1889 by Lewis A. Swift at the Warner Observatory, Rochester, New York, and was described by Swift as being pretty faint. It was rediscovered on 8 February 1973 by Tom Gehrels at the Palomar Observatory, California who estimated its brightness as a very low magnitude 19. It was also observed in 1981, 1991, 2000, 2009 and 2018. Now that we know comets are a prime target for imaging on ATEO-1, we will be attempting to push these "dirty snowballs" as subjects for education projects such as compiling color images and creating animations of their movement in the night sky. Amazing how one 10 minute exposure can capture the fainter wanderers!